Happy halfway through the work week! My lookbook with the talented Minh from Mahal Style continues and I'm excited to show you this third look! I love this top (as I had expressed here) and I also love these floral jeans! Suffice to say that pairing these together makes me love this outfit infinitely. The airiness of the shirt and the pale colors of the whole outfit is so girly and perfect for a nice Sunday brunch! For all of my fellow San Diegan Fashionistas, I know we are amidst the wonderful events of Fashion Week San Diego, but I also wanted to let you know of another great event coming up! 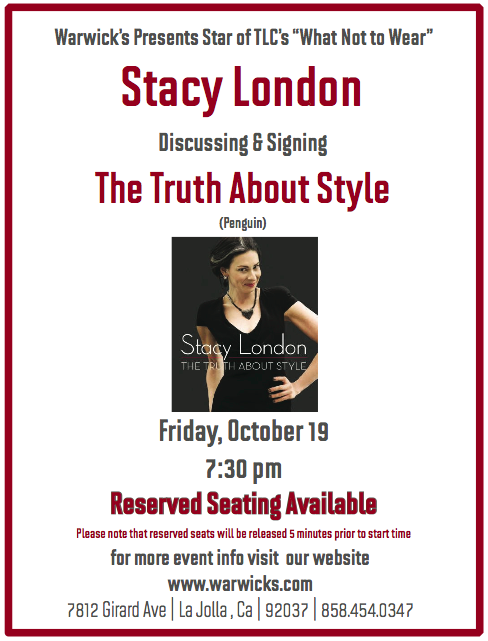 The witty and fashionable Stacy London from "What not to Wear" has written a new book "The Truth About Style" and will be doing a book signing at Warwicks in La Jolla! This book goes beyond the surface of fashion and delves into the root and struggles of personal style. If you want to know more about the book I was sold on it with this interview on the Today Show. See the flyer for more info. Hope to see you there! ☮, ♥ & Thanks for Stopping by! you are too amazing, what a bauty with such a good style! LOOKS like this is gonna be a super fun event!!! She rocks!!! Gorgeous! Love your pants. I love Stacy London! I would LOVE to be there! You look so cute! just wanted to let you know that i tagged you in a post of mine on sd fashion week! you can check it out on my blog!